1929, Grevesmuehlen, East Germany (near Rostock). Sitting: Marie-Gertrude Botta, mother of Erika Blass, with Erika on her lap. 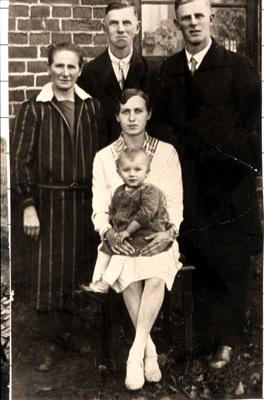 Standing, left to right: Dorothea Stockfleth (née Gedon), Erika's paternal grandmother; Uncle Otto Stockfleth; William Stockfleth, Erika's father.